In Barcelona there is a grand street market, Boqueria. It’s a culinary treasure, one of the greatest street markets in Europe. And that is saying something if you’ve had the pleasure to wander the cities of Europe and felt the amazement as one food emporium after another spans the city street. In the United States, there is a fleet of restaurants called Boqueria, four in New York and two in Washington, D.C. The moto of this chain is “From Barcelona to New York.” The restaurants are treasures, letting you sample tapas with utter authenticity. And who is responsible for this? A Frenchman. Yann de Rochefort is the founder. As a youth, he grew up in France and spent August on a little boat sailing the Mediterranean. He would stop at Barcelona and stock up that small family boat with days of shopping: Rioja, whisky, anchovies … Yann’s intimate relationship with Barcelona is decades old. Boqueria is his second generation of restaurants. It reflects all his experience, expertise and love for the tapas of Barcelona. Last weekend we ate at one of the New York City outlets and enjoyed Spinach with Garbanzos with Raisins and Pine Nuts. It’s glorious. Look! Ah, “standard” names but hardly standard recipes. 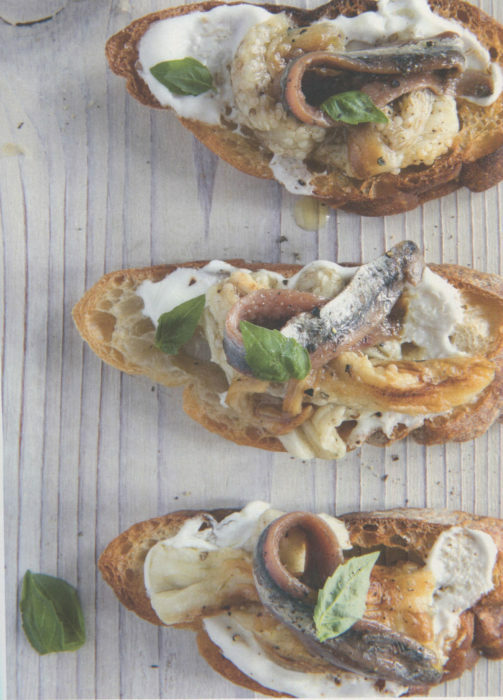 Look at this treat from The Classics, Salt-Cured Anchovies and Eggplant on Toast. And I’m sure to taste. Suzi and I are testing recipes from the book with fanaticism. We’ll let you know the delicious results. In the meantime, if you can visit one of the restaurants, do. 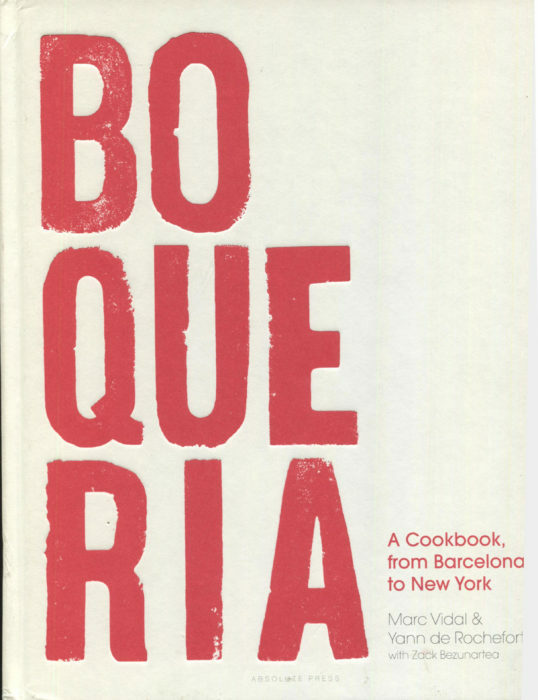 Or, probably better, put a copy of Boqueria in your kitchen and enjoy it the year round. 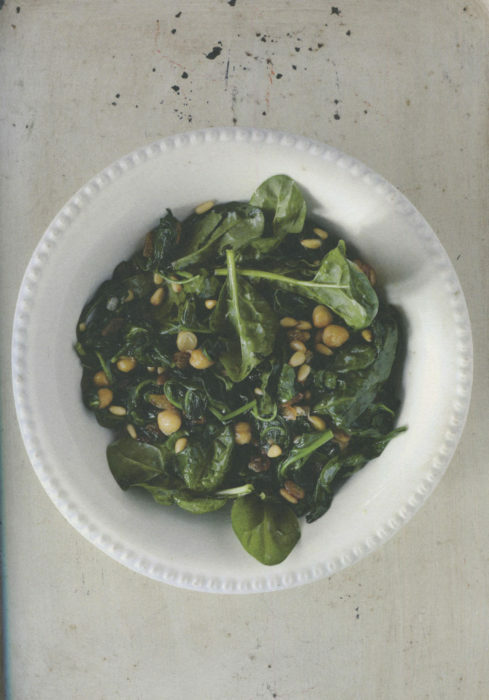 I did like that Spinach with Garbanzos, Raisins and Pine Nuts so much that I’m posting the recipe for you tonight. Oh, you don’t like spinach? You will. You will.